Practically everywhere I turn these days, new products are cropping up to help you find content relevant to your interests. In addition to my6sense, who I covered yesterday, we've seen a fair share of Twitter applications, iPhone apps and Web sites looking to find signal in the noise, and each takes a unique approach. The latest to join the scene is a service called Zite, which bills itself as a personalized Web filter, leveraging your social profiles to guess your interests. 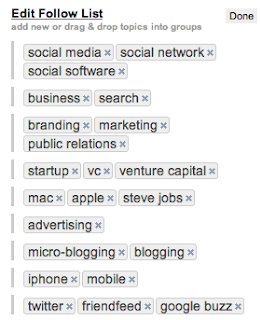 You can improve the filter by grouping keywords you are interested in, and can dive down by domain to see what different sources are saying about your interests. Upon entering Zite (and you can use one of 50 invites with this code: http://zite.com/?code=louisgrayorg), you are prompted to enter your user name for Twitter and Delicious. Zite analyzes the content you share on those sites, and delivers two things: recommended articles and keywords called your "Follow List". The recommended articles are split into two: first being today's recommendations, and the second being older items you might like, going from 1 day ago to as much as a month. If you like the articles you see, simple click the star to the left of each article, or you can read it. Zite intends to improved based on your feedback, so the more stars, the more you get to tailor it to your interests. 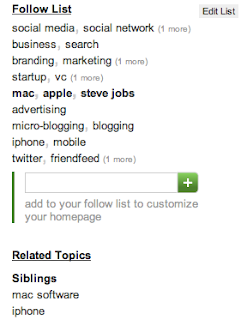 The "Follow List" at first is a quick stab at what Zite thinks you are most interested in. But the power of this list comes from your own edits. You can add new terms to follow, and interestingly, drag and drop topics into groups. This lets you have a set of results for "Startup, VC and Venture Capital", or another group for "Branding, Marketing and Public Relations", for example. 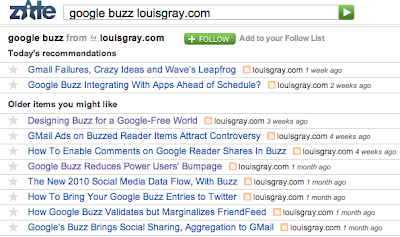 You can also set up groupings for multiple domains, for example "louisgray.com and scobleizer.com", if you wanted to. Once the follow list is created, you can click on any of the groups and see recommended results on Zite from those terms. Zite tries to guide your exploration further with related topics, called "Parents" which are higher level topics, or "Siblings" which add more terms to those you're currently viewing. The ability to parse through RSS and other news sources by topic is something I like a lot, and you could see that from my feedback on Lazyfeed. Zite lacks the real-time updating element and cool UI that Lazyfeed brings, and doesn't clearly respond to implicit feedback, working on the explicit nature of your own activity. But if you want to see recommended articles from the Web on topics you like, you should check it out. You can get in to Zite's closed beta with one of 50 invites using this code: http://zite.com/?code=louisgrayorg. Disclosure: My6sense is an assumed competitor to some aspects of Zite, and My6sense is a Paladin Advisors Group client, where I am managing director of new media.